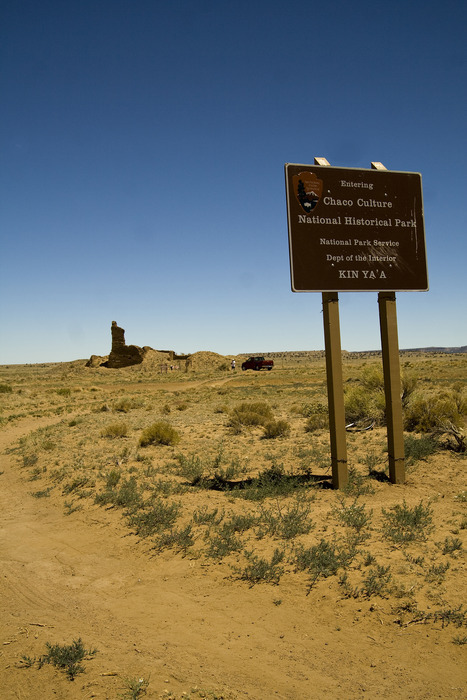 Overview: Kin Ya'a is one of several major Chacoan outliers that are protected by the National Park Service at Chaco Culture National Historic Park. This site actually lies within an isolated section of CCNHP that is separate and detached from the main section of the park. "Kin Ya'a" means "Tall House" in the Navajo language. History: Kin Ya'a is a small Chacoan great house that lies about 25 miles south and west of the South Gap entrance to "downtown" Chaco Canyon connected by a major Chacoan Road. The tree ring dates from the site range from A.D. 1080 to 1106 with the prominent cluster around A.D. 1106. This represents a relatively late Chacoan construction date. Great Houses are thought to be ceremonial centers utilized by many surrounding communities. It should be noted that archeological evidence of more than 400 Chacoan period sites exist within a 10 mile radius of Kin Ya'a with more than 100 lying within 4 square miles surrounding the Great House. The placement of the terraced Great House orients it towards the winter sun. The building contains at least 26 ground floor rooms, 9 second-story rooms, and an undetermined number of third-story rooms. There are 3 enclosed surface kivas and a relatively rare tower kiva extending four stories. The Kin Ya'a tower originally stood a full four stories at an estimated height of 36.5 feet. The lower chamber and much of the second floor remain intact, while only a rectangular column of the northeast corner extends through the third and into the fourth story--presently 31 feet high. The interior of the tower kiva may have contained 4 floors and had a very special ceremonial function. Four stacked kivas may have been symbolic of the 4 worlds central to Puebloan belief. Some researchers suggest that the towering structures may have been used for signaling to other communities. Less than a dozen tower kivas are known to exist in the Chacoan world--several of them located just south of the Chaco Canyon. Direct connection to Mesa Verde style architecture is a source of much controversy. Outliers share many of the typical Chacoan traits, such as architecture, masonry, roads, great kivas, enclosed plazas, pottery, etc. 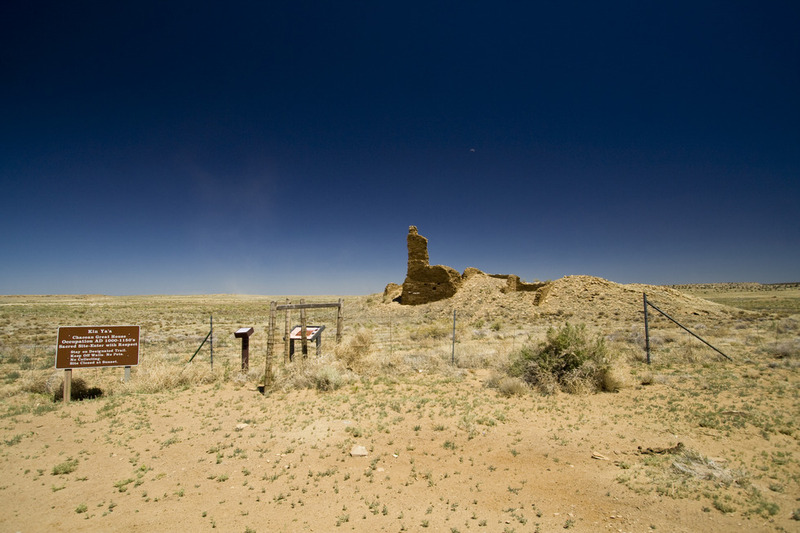 Some researchers believe the outliers were established by the people of Chaco Canyon as they expanded their world and influence into surrounding areas. Others believe that local populations embraced the Chacoan world and culture and emulated the great houses and their impressive architecture. 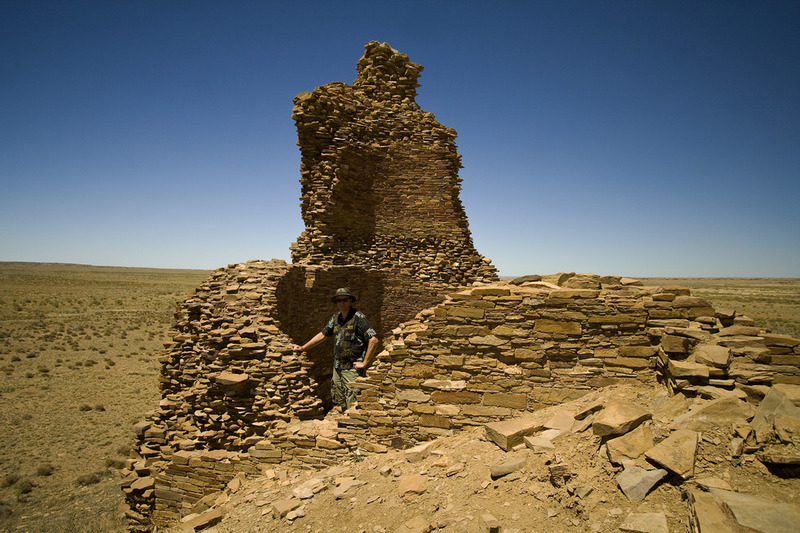 The relationship between the outliers and the people of Chaco Canyon is not well understood. Were the outliers independent or did they support and serve the people in the core? Hike: As you approach Crownpoint from the south on NM371, look for the Ikard-Newson Propane site on east side and pass through the south gate. There's a maze-like network of crisscrossing double-tracks heading to the east. As you crest the ridge you'll make out the distinctive spire of the 4-story tower kiva on the lower plain. Pick a path heading towards the north side of the site where the TH and registry is located. 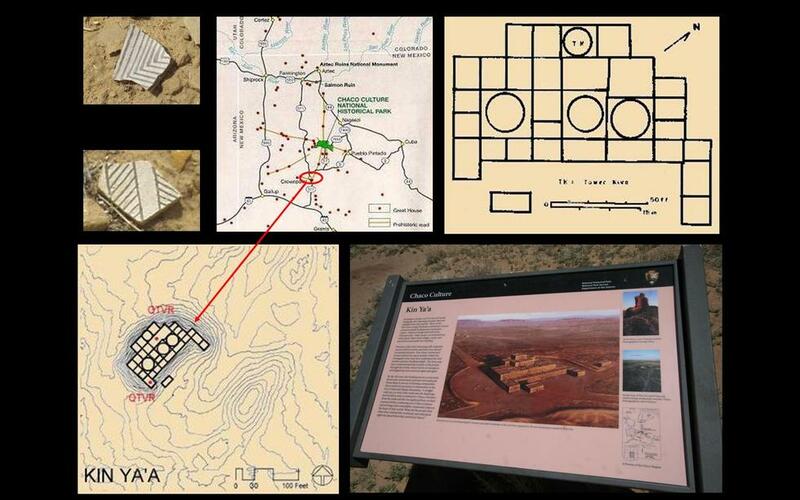 Sign the registry and complete a CCNHP trail pass and explore the Kin Ya'a ruins at your leisure. You are likely to have this site all to yourself (the last entry we saw in the registry was 6 days prior). You will likely be drawn to the spire of the tower kiva. Note the thickness of the masonry wall as it tapers towards the sky. Don't ignore the large trash midden to the south of the main site. Although not as abundant as I expected, there's still many fine examples of Chacoan black and white pottery sherds to be examined. There is a roadway which is evidenced by a pronounced swale (a low-lying or depressed piece of land) which approaches Kin Ya'a from the northeast. The roadway turns at an angle and leaves the site on a southwest orientation, heading toward Hosta Butte and Coyote Canyon. The road is defined by a linear swale 18 to 27 feet in width and 3 feet deep. Today, the prehistoric roadway which passes through Kin Ya'a is known as the "Great South Road." There are several roadways which enter the building from the northeast. 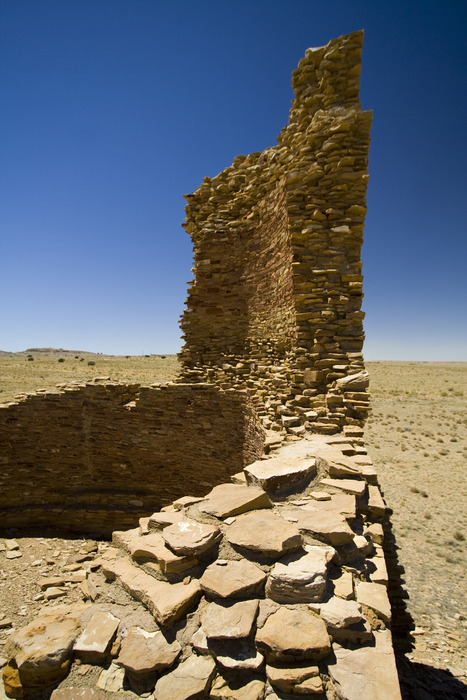 One leads NNE toward Bee Burrow, and then heads north to the South Gap of Chaco Canyon. Another leads northeast toward Pueblo Pintado. 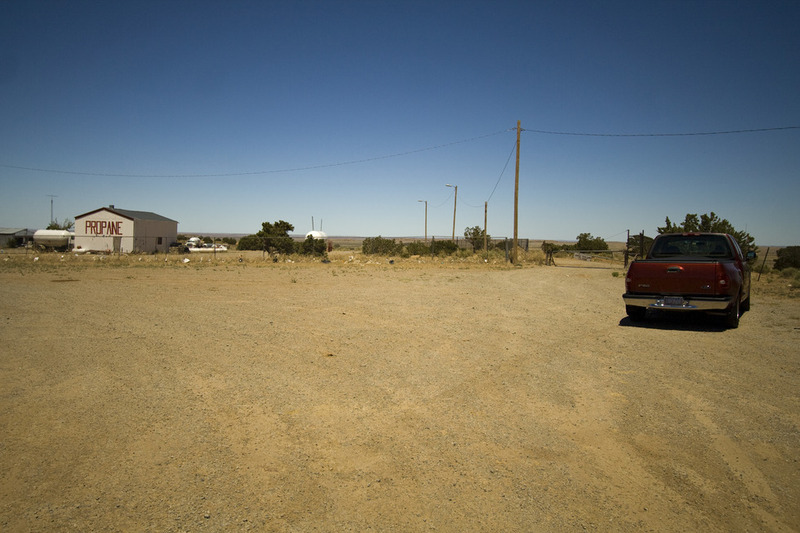 The roads may have been used to direct travelers to Chaco for ceremonies and trading, or to symbolize the importance of the people's connections to Chaco Canyon. Summary: Kin Ya'a was my first experience exploring a Chacoan outlier. 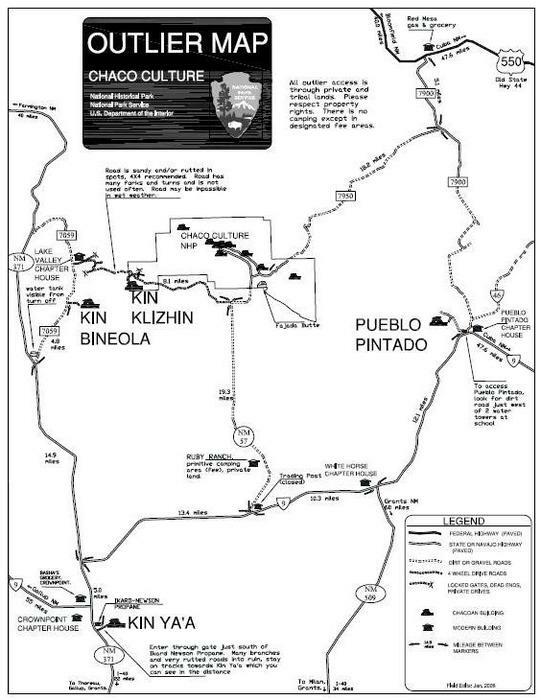 HAZ hike descriptions now exist for 3 additional Chacoan outliers - Kin Bineola, Pueblo Pintado, and Kin Klizhin. Go experience one for yourself! Enjoy! 1.Head south on Route 57 for about 20 miles until reaching Route 9. 2.At the Seven Lakes Chapter House (abandoned), turn right on Route 9, towards Crownpoint. 3.Drive 13.4 miles on Route 9 until you come to NM371. 4.Head south on NM371 towards Crownpoint. 5.About 5 miles along NM371, look for the Ikard-Newson Propane site on the east side. 6.Pass through the south gate and travel east through a maze of double-tracks about 1 1/4 miles until you reaches the Kin Ya'a site.